Macnas the award winning internationally acclaimed spectacle theatre company from Galway, led by Artistic Director Noeline Kavanagh have teamed up with The Connacht Hospitality Group in support of The Macnas Young Ensemble. Macnas are known across the globe for their large scale interactive, immersive spectacle events for audiences, communities and festivals, with their shows involving up to 300 participants with audiences of 50,000 people in attendance. Founded in 2009, The Macnas Young Ensemble are a core part of Macnas and have presented their own stand-alone productions supported by Macnas. Under the tutelage of Macnas Performance Director, Miquel Barcelo and other visiting facilitators, the group develop new work that is relevant to them and which feeds into the present and future of Macnas. The Young Ensemble is open to anyone aged 15-19, the workshops take students through a range of performance styles including Commedia Dell’Arte, mask work, ensemble performance and physical expression. Passionate about nurturing the next generation of Spectacle artist in Galway city and county, the Macnas Young Ensemble has 45 members and the workshops are free of charge and run throughout the entire year on a weekly basis making the support of The Connacht Hospitality Group invaluable to the next generation. This partnership will allow Macnas to develop a world-class dynamic performance ensemble and Drumming troupe for Galway city and county. This support will also help to deliver Young Ensemble and Drumming events locally, nationally and internationally and support Macnas to engage with communities enabling young people to access free high quality large-scale cultural performances and activities. The youth drumming troupe aged 15 -19 which will be led by the Macnas parade Musical Director Orlagh De Bhaldraithe in collaboration with Eímhín Craddock, drummer and facilitator. This troupe will pioneer new beats on the street with the Macnas signature high octane performance. 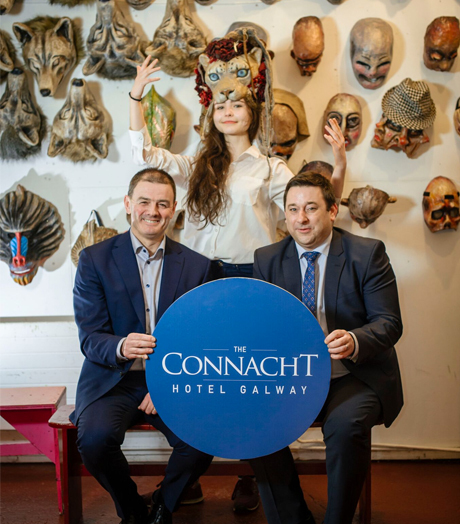 “We at the Connacht Hospitality Group, are delighted to be able to support a company as exciting and passionate as Macnas, as a group we have always been huge supporters of the local community through sports, festivals and local charities and we are very excited to be able to now extend this support out to the Arts. We believe in the message Macnas delivers and as a business we recognise the value the Arts has brought to our wonderful city, particularly as we build up to Galway 2020,” said Wayne Neilon Group General Manager. “Macnas has a strong vision that encompasses the continual training and development of young artists and performers within the company to promote innovation and excellence, the partnership with The Connacht Hospitality Group will ensure this becomes a reality,” concluded Noeline.